However, I've got to do something. I've lived here nearly a year now, so the time has come to transform this kitchen. As a renter, I can't do any major renovations. The floor stays. The cabinets and counter-tops stay. 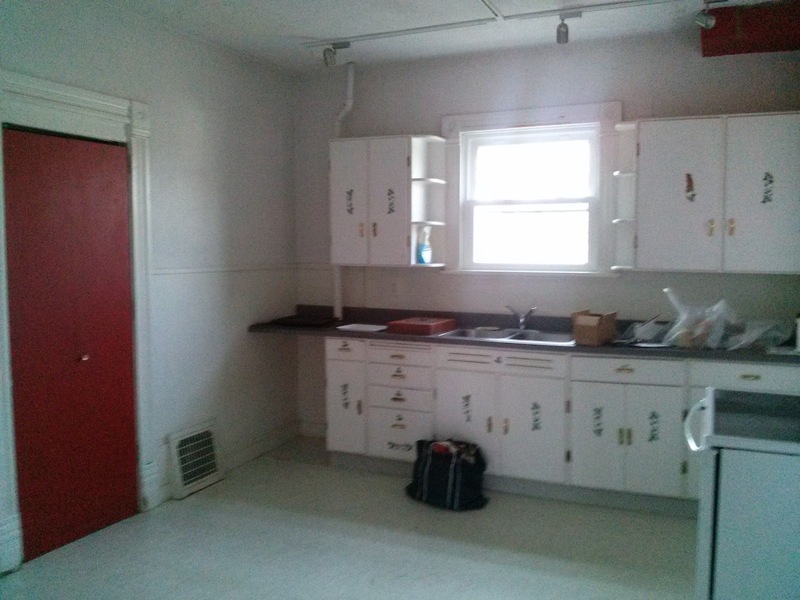 But my landlord will allow me to paint the cabinets, cupboards, walls, and that red pantry door. I plan to scrape off those leaf stickers, paint the pantry door with chalkboard paint, and paint the walls, cabinets, cupboard, and ceiling. So now it's time to brainstorm. 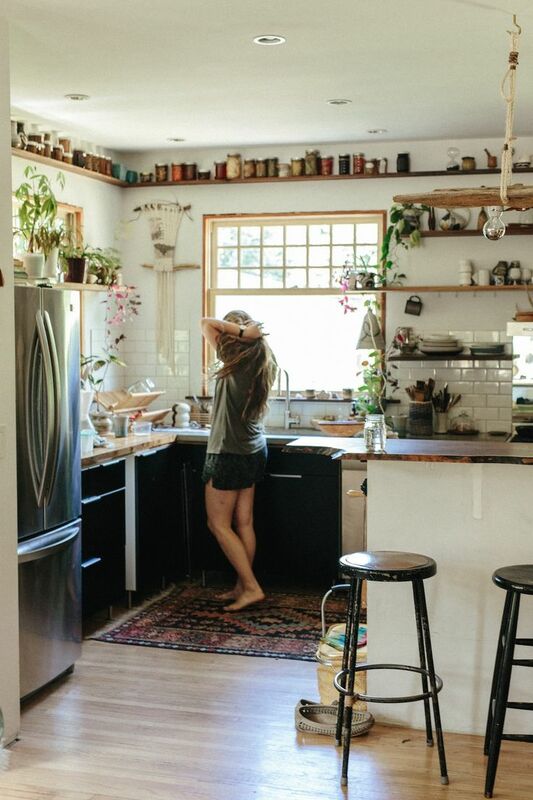 This kitchen actually reminds me a lot of mine – or at least its potential. I don't have a gorgeous wood floor in there, but I do have white cabinets, gray counter-tops, and a big window over the sink. If I were to remove those leaf stickers, update the hardware, and give everything a fresh coat of white paint, that'd make a huge difference. 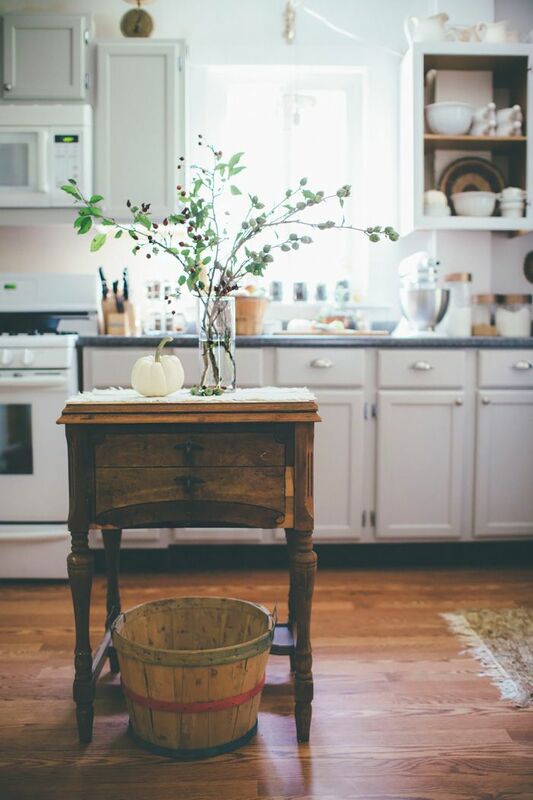 Then I could bring in a wood table and some rustic wood touches. Maybe I'll take a cupboard off the hinges and have a bit of open-shelving, too? I'm not crazy about the hardware on these cupboards (too sleek and modern for my taste), but I love the color of these lower cabinets. It reminds me of a rainy day in a seaside New England town. 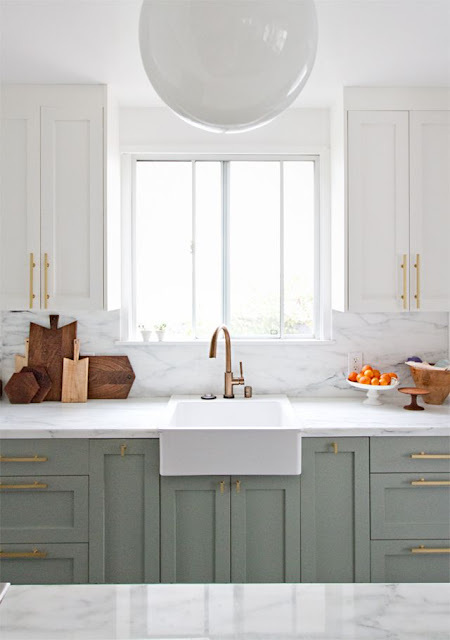 Plus, I'm a big fan of the non-matching-color lower and upper cabinets... especially when the upper cabinets are kept white along with the walls. 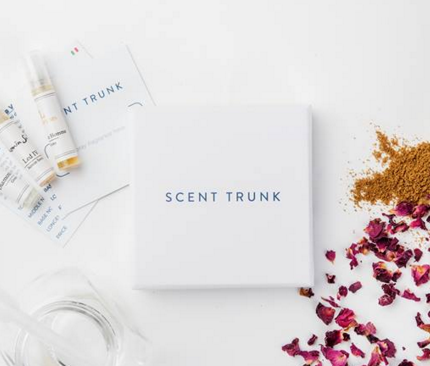 It feels airy but grounded. In this kitchen, I just love the pops of my favorite color. I can never have enough turquoise sprinkled throughout my living space. It makes "shopping my own apartment for decor" so much easier when I can move things around to different rooms with ease. I also love the details here. The shelf for mugs (I have so many!) and the metallic letter M. Cute, cute, cute. There are several things I'm digging in this retro kitchen. 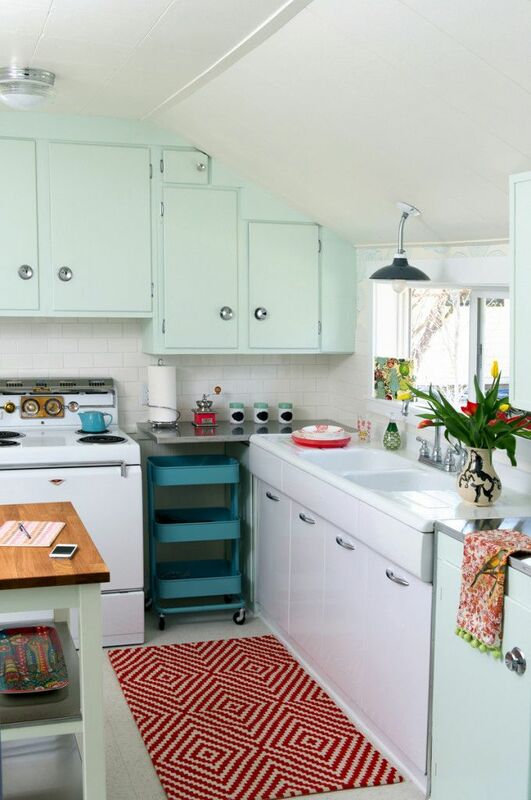 First of all, the minty color of the cabinets is quite lovely. I think I'd just do it on the lower cabinets and leave the upper cupboards white, though. Like my kitchen, there's an awkward gap with nothing under the counter. Right now, I have a bad habit of stashing things like pizza boxes there. I much prefer the idea of sliding a little rolling cart under there, especially for keeping things I use often handy. Also, I like the unexpected punch of red on the floor. Red and mint are a match made in vintage heaven. 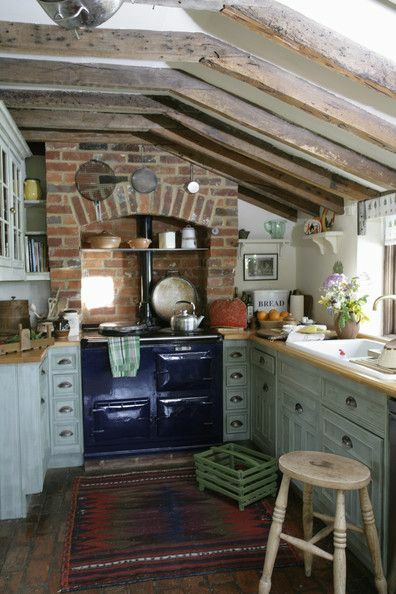 Can I just move into this rustic cottage kitchen?! The beams! The exposed brick! The omg... brick floors! Bring me my smelling salts! I can't put up beams or lay any brick, but I do have a brick rug in my office that could be moved into the kitchen. I also like the hardware here and the color of the lower cabinets. It's all so cozy, warm, and inviting. I really like this kitchen, too. It looks very effortless, mix-and-matched, and casual, which I love in a kitchen. I like the idea of putting down a big, ornate rug... especially since white linoleum isn't so easy on the eyes. I don't love the dark cabinets. I wouldn't want all my cabinetry open-shelving. I do like the mismatched stools. 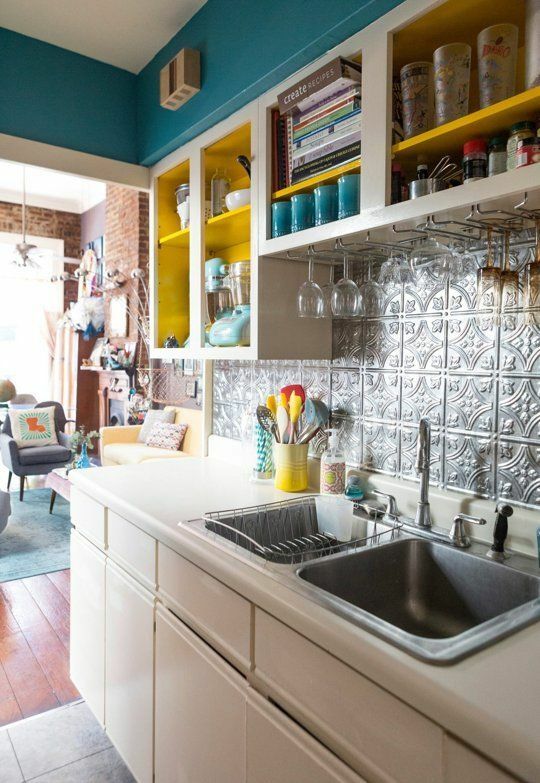 In this kitchen, I'm drooling over the metallic, antique tile backsplash. This isn't hard to do/fake on the cheap. I've seen the plastic panels at Menard's. Maybe I'll opt for copper though? 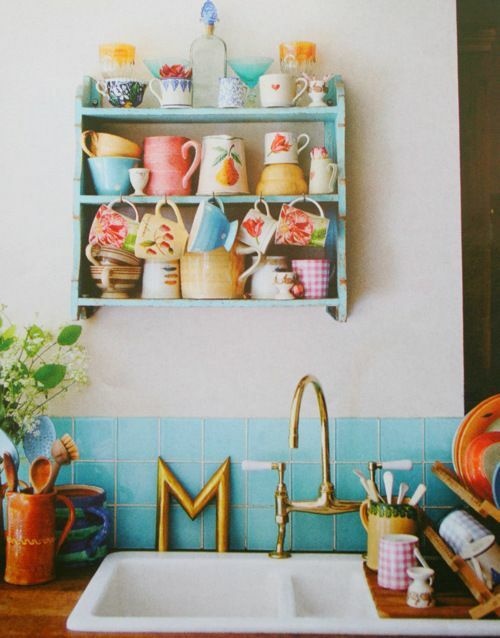 Again, I wouldn't want open shelving on all my cupboards, but I do like the idea of painting the insides a fun color and displaying colorful kitchen items... especially since all of my kitchen items are different colors ranging from lime green and turquoise to orange and red. 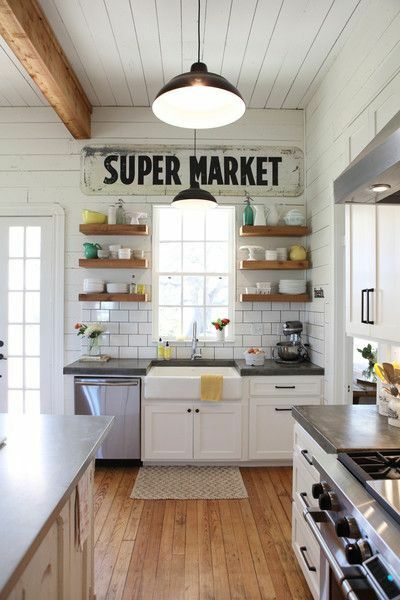 Last but certainly not least, I like the big super market sign in this room. I have a big piece of plywood leftover from another project. 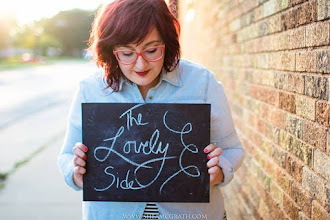 I think I might get all crafty and paint/distress it into a vintage-looking sign. I'm also a sucker for subway tile, but I don't think I'll be doing any tile laying in my rental. UGH. It's all so beautiful and HUGE. I am quite jealous over here in my kitchen-closet!